Franklin Templeton’s Mark Mobius: The Association of Southeast Asian Nations (ASEAN) is an example of how smaller global economies can band together to exert a more powerful influence within the international community and have their collective voice heard. ASEAN is made up of 10 members: Brunei Darussalam, Cambodia, Indonesia, Lao PDR (Laos), Malaysia, Myanmar, the Philippines, Singapore, Thailand and Vietnam. Originally founded in 1967 to foster regional cooperation and promote peace, ASEAN today has an ambitious agenda that includes accelerating economic growth, trade and regional interests in the decades to come. I’ve invited my colleague Dennis Lim to share some of his thoughts on the progress therein, and the investment potential we see in the region. We think the potential for ASEAN is tremendous for a number of reasons. The region has a population of more than 620 million, but unlike the economic powerhouses of Japan and China, which have a larger collective population, ASEAN nations have a more youthful demographic. For example, China’s median age is 37 and Japan’s is 46, while the median age for the ASEAN countries of Cambodia and the Philippines is 24.1 An aging population tends to exert a greater drag on resources, with fewer working-age people to support growth. If you put this more youthful population together with factors such as the rising per-capita GDP generally seen in the region, and its progress toward reforms and collective cooperation, to us the attraction to these markets seems obvious for multinational companies offering consumer goods and services, and for investors like us. Additionally, wages are currently lower in ASEAN countries than in Southern China, so manufacturing companies have been relocating to Vietnam, Indonesia and elsewhere in the region. When you combine these favorable demographics with the region’s growth potential, you can see why they’re worth paying attention to. We believe there is good potential for Asian economic growth to feed into corporate profitability, leading to expanded investment opportunities. While our investments have been currently focused on Thailand, Indonesia, Malaysia and Singapore, we expect Vietnam to rapidly come onto the radar screen as the breadth and depth of the market continue to improve. The same is true of the Philippines. Over a longer time frame, we think Myanmar, Cambodia and Laos could be exciting as well. In November, Myanmar hosted the ASEAN-India summit, which coincided with the 25th ASEAN Summit. We should remember that Myanmar is the western-most nation in ASEAN and shares a common border with India, so if relations between the two sides continue to grow, then Myanmar could eventually serve as a gateway between India and ASEAN via land. The focus of the summit was on further liberalization to grow ASEAN-India trade, targeting US$100 billion by 2015. Significant ties already exist between the AEAN and India. There are sizeable Indian populations in several ASEAN countries, including Singapore and Malaysia. Cross-border investments and trade have grown sharply in recent years, and although not without differences at times, cooperation with China will also likely be important to ASEAN. China’s proposed Asian Infrastructure Investment Bank (AIIB), seen as a rival for financing to the World Bank or the Asian Development Bank, includes ASEAN members. We think, longer term, Myanmar has tremendous potential. It has vast natural resources that are yet to be fully tapped, and we are now seeing foreign investments pouring in after sanctions in place for years have been lifted. For example, the country has just awarded two telecom licenses to international operators. As Myanmar’s economy is starting from a low base, we believe it is set for potentially very high growth in the next few years. The road is likely going to be long and difficult, but if Myanmar’s government manages its transition process well, we think there could be good potential opportunities there for investors. Unfortunately, there is no stock market in Myanmar at the moment, so we have to invest indirectly, for example, through companies listed in Thailand. We are confident about the long-term prospects of the Thai market. 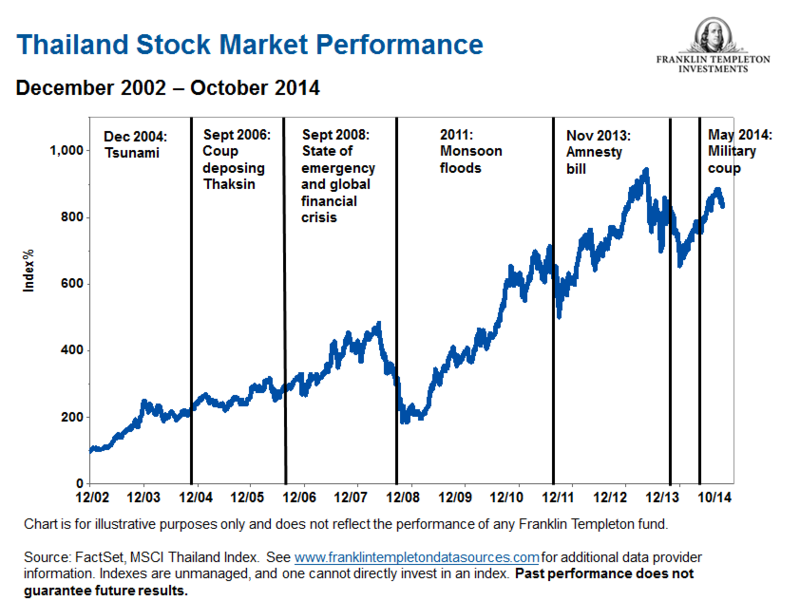 We note that, in spite of having endured a tsunami, serious monsoon flooding, chronic political instability and a major financial crisis since 2002, the Thai market has maintained a solid long-term uptrend, which we believe demonstrates the resilience of Thailand’s people and the Thai economy. The country will also be a key member of the ASEAN Economic Community (AEC), which is expected to come into force in 2015 and create a single market out of 10 Southeast Asian nations. We think this effort could yield substantial longer-term benefits. In the United States, the prospect of rising interest rates is something that market participants will likely have to cope with going forward. 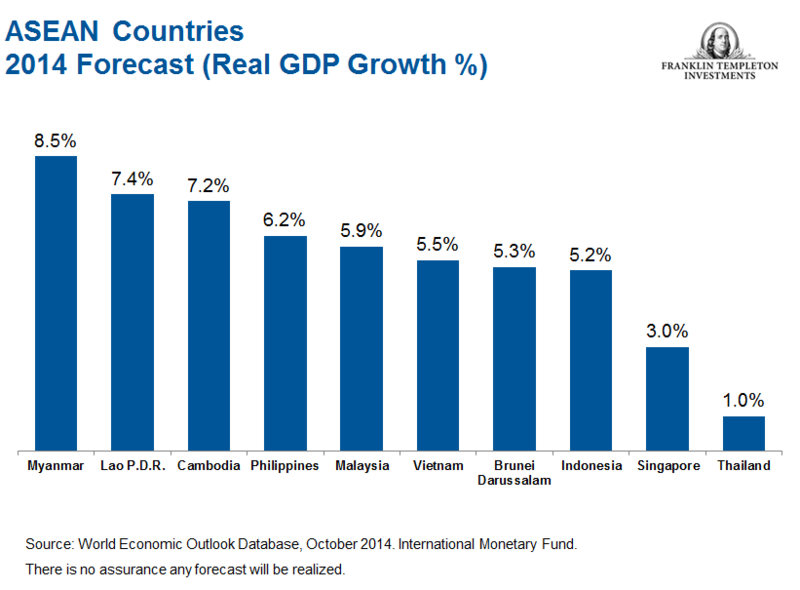 How ASEAN countries weather the impact of Federal Reserve (Fed) tightening potentially depends on how fast and how much rates rise. Financial markets are currently awash with liquidity, and we have yet to see inflation and interest rates move up significantly on a global scale. Most investors are likely aware of the activities of the Fed and European Central Bank (ECB), but perhaps less talked about is the fact that the People’s Bank of China (PBOC) has an even bigger balance sheet than the Fed. If you combine the balance sheets of the Fed, the ECB, the PBOC and the Bank of Japan (BOJ), their combined assets at the end of 2013 stood at over US$14 trillion, which is almost the size of the US economy.2 We know that the BOJ and PBOC continue to print money; the BOJ just announced an ¥80 trillion (about US$720 billion) package. A lot of the impact of central bank policies on ASEAN countries will likely depend on how quickly global economies return to health. When we see GDP growth start to pick up in Europe, Japan and the United States, and concerns about a hard landing in China dissipate, we believe that would be the time we would expect interest rates globally to start to rise. Malaysia and Indonesia: Subsidies Subsiding? Malaysia is currently running a fiscal deficit because of the system of subsidies that it has had in place. The ruling party, which has been governing the country since it gained independence more than 50 years ago, has faced serious challenges from the opposition in the last couple of elections, which has made it difficult for the government to roll back these subsidies. We are now seeing that happen gradually; the government recently announced that starting in December, the cost of a popular grade of gasoline and diesel will be based on a managed float system. This move could help improve public finances going forward. The comments, opinions and analyses expressed by the individuals herein are personal views and are intended to be for informational purposes and general interest only and should not be construed as individual investment advice or a recommendation or solicitation to buy, sell or hold any security or to adopt any investment strategy. It does not constitute legal or tax advice. The information provided in this material is rendered as at publication date and may change without notice and it is not intended as a complete analysis of every material fact regarding any country, region market or investment. Data from third party sources may have been used in the preparation of this material and Franklin Templeton Investments (“FTI”) has not independently verified, validated or audited such data. FTI accepts no liability whatsoever for any loss arising from use of this information and reliance upon the comments, opinions and analyses in the material is at the sole discretion of the user. Products, services and information may not be available in all jurisdictions and are offered by FTI affiliates and/or their distributors as local laws and regulations permit. Please consult your own professional adviser for further information on availability of products and services in your jurisdiction. 1. Source: CIA World Factbook, 2014 estimates. 2. 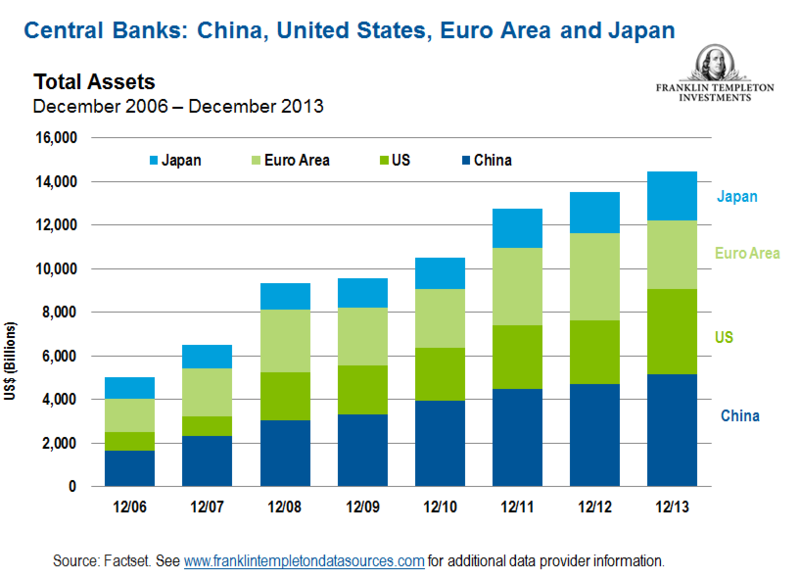 Source: European Central Bank, US Federal Reserve, Bank of Japan, People’s Bank of China, as of 2013. 3. Source: : World Economic Forum. 4. Source: ASEAN Economic Community Factbook. Jakarta: ASEAN Secretariat, February 2011.